Mayall, Jeremy Mark and Mayall, Courteney (2018) Sostenuto. Amongst exhibition. Morrinsville, New Zealand, Wallace Gallery. 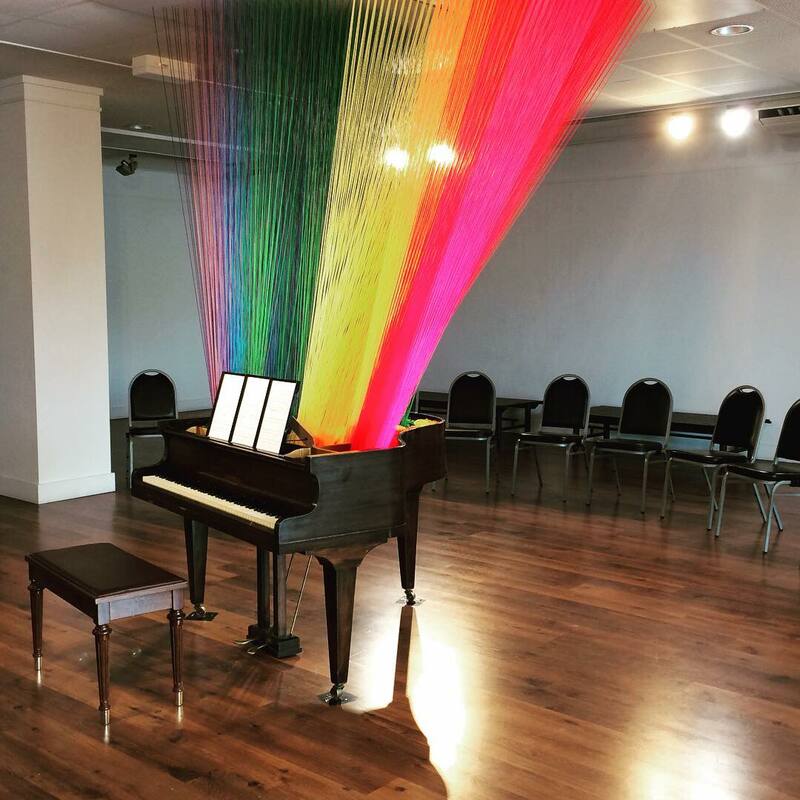 A collaboration with Courtenéy Mayall sostenuto an interactive site-specific installation 1844 strands of coloured yarn through board + piano This work is inspired by ideas of kinetic sculpture, science, and sound diffusion. Through representing colour in a somewhat synaesthetic manner, there is a visual representation of how sound may begin to emerge from the instrument - through the vibration of the strings. This work is an interpretation of sound waves, which allows them to be visualised through movement of the yarn. Hold down the sustain pedal (the right hand pedal) and the dampers of the piano are lifted allowing the resonance of the strings to sing for the natural decay of the vibrations after the strings are hit with the hammers. This resonance also allows the yarn installation to move sympathetically with the vibration of the string. Repeat key presses with a steady pulse and enough amplitude and the yarn will really begin to demonstrate the way waves travel on a string. The sustain pedal was invented in 1844, and is a tool which allows this installation to work, really transformed the way a piano would be played and how composers were able to explore the sound that occurs after the initial attack of the notes - to make the most of sympathetic resonance, and everything that is possibly with the inter-relationships of sound. THIS IS AN INTERACTIVE WORK - SO PLEASE PLAY THE PIANO. But remember this is also a fragile work, and an old instrument - so please be gentle.